Baking cookies and different breads for Christmas is what we love to do the most! Pitta ‘Mpigliata is a typical Calabrian holiday pastry. 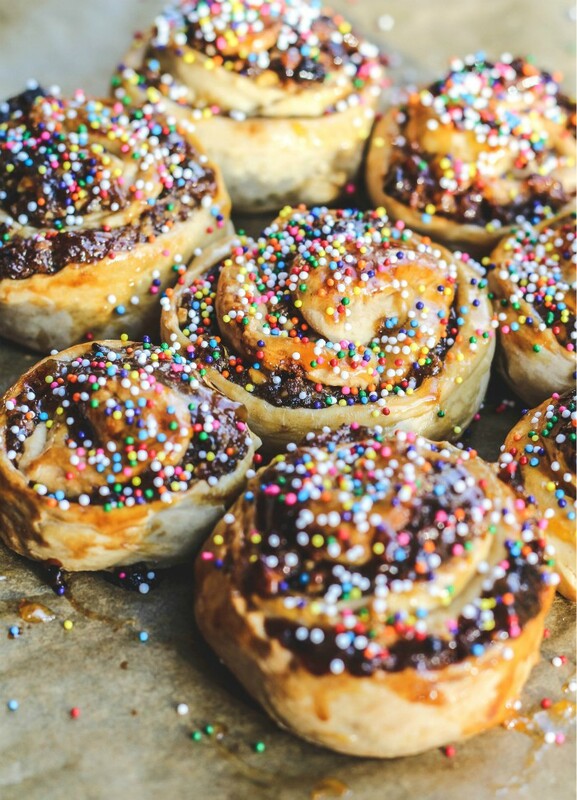 These pretty rosettes are so festive with the colorful sprinkles. My mother-in-law happens to be from Calabria and I have asked her about this Calabrian dessert in the past and she has told me she doesn’t make it. Pitta ‘Mpigliata could also be called pitta ‘nchiusa or pitta china, which in Calabrian dialect means “filled” or “stuffed”. They also could simply be called rosette, or little roses. You could vary the filling with raisins, currants and prunes, or just raisins, and different nuts.Our dear friend Aldo from the Cosenza region of Calabria brings us a box of these rosettes every year. He makes his Pitta ‘Mpigliata smaller and they actually could even seem like cookies, but they are pastries. Aldo has explained to me in detail how he makes his pitta, but I never baked them with him. The holidays rush by and we are lucky that he even has the time and the kind heart to bake them every year and share with us his sweet pastries. My goal was to eventually bake with him and learn how to make this. 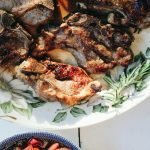 When I was looking through Rosella Rago’s new book Cooking with Nonna, A Year of Italian Holidays, I was interested in making different recipes to share here with all of you. When I came across Nonna Rosa Virone’s Pitta ‘Mpigliata recipe I knew it was time to give it a try! 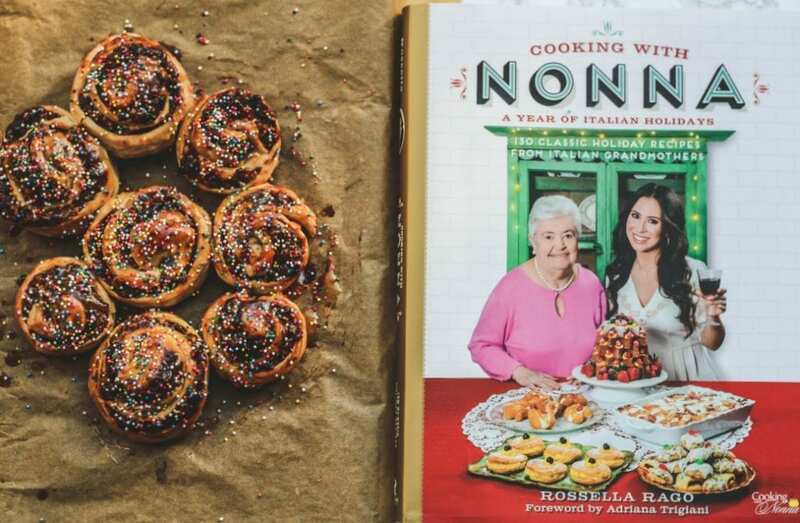 If you haven’t seen Rosella’s recipes yet online or came across her first book, you should consider her holiday book. It is filled with recipes and memories of her own Nonna Romana and other Italian and Italian-American nonnas. 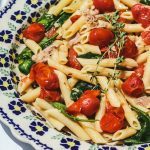 I love following along Rosella on Instagram and watching her cook with her adorable nonna Romana. I’m hoping I got pretty close to how Aldo would make these. Maybe next Christmas he’ll bake with us and show us his version. As I mentioned, my Calabrian suocera (mother-in-law) does not make these, but she makes something sort of similar. 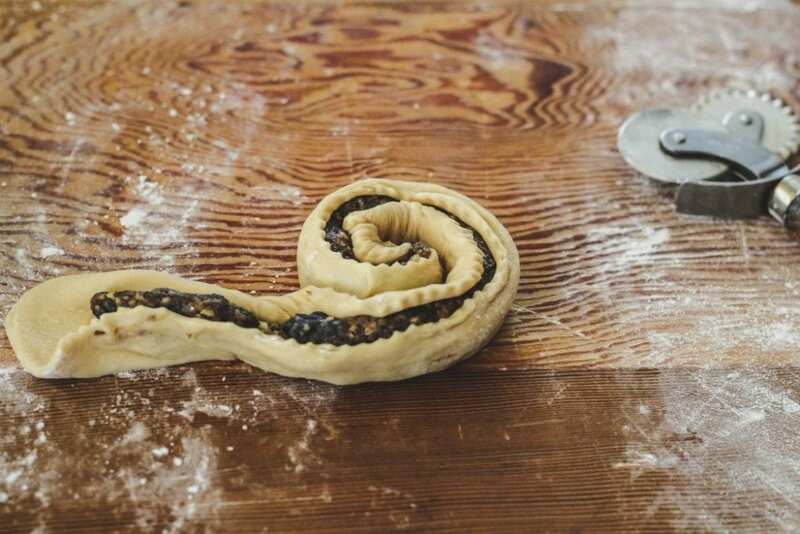 It’s her fabulous dough that she uses for many recipes filled with her incredible fig filling. 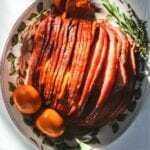 There are so many recipes that incorporate dried for Christmas in Italy. The recipes vary from region to region, and as this pitta recipe is a case in point, it even varies within an actual region. 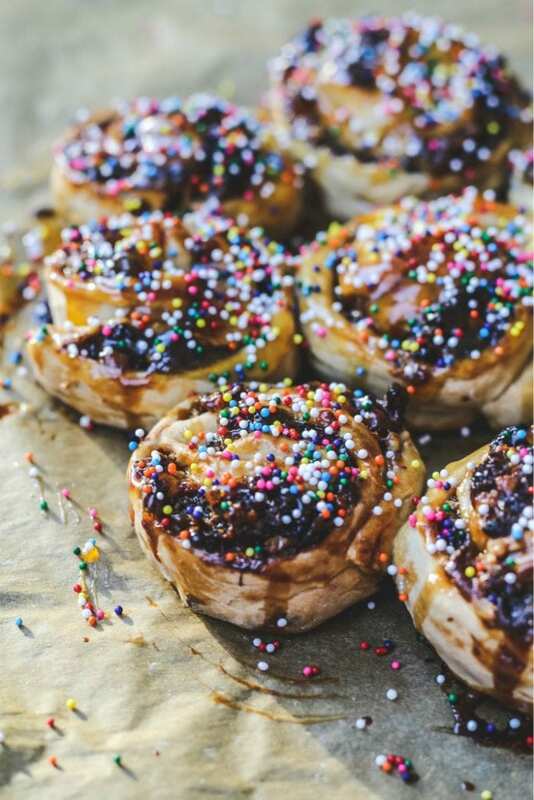 So you could be in one part of a region like Calabria and find these pastries for Christmas, and in another part and find people that never heard or saw these before. The recipe calls for rolling out a large piece of dough that you place in the pie plate and you place the rosettes on top of this dough round. It ends up being like a cake. I instead used the extra dough and made more rosettes. I did make more filling (I doubled the filling recipe)so I could make more rosettes. I knew my kids would appreciate more pitta’s to enjoy. I also made the second batch free form on a baking tray. I’ve seen recipes there they keep the rounds together with toothpicks. There was no need to do that as they held their shape fine. 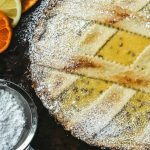 HOW TO YOU MAKE PITTA ‘MPLIGLIATA-CALABRIAN FRUIT AND NUT PASTRY? The first thing you need to do is prep your pastry dough. It’s a simple dough of white wine, olive oil, sugar, vanilla, eggs, flour and baking powder. I used vegetable oil instead of olive oil (my kids aren’t crazy about sweets made with olive oil)and I used a non-alcoholic white wine. You could use whatever white wine you like or non-alcoholic white wine like I did. Cover your dough and prep your filling. The filling can be made with raisins and dried plums (prunes)and any nuts you have on hand. I did have on hand raisins, prunes and walnuts. You could sub orange juice for the vermouth in the filling. You roll out your strips super fine (like 1/8 inch thick) and are about 12 inches long. You trim the strips with a pastry cutter. The recipe does not specify how much filling to use. Be careful not to put too much filling in the middle, it will run out fast. The point is to get a long strip of the filling in the middle. Make sure it’s not too high. It’s difficult to measure. Like many Italian recipes, you know how to make it because you’re baking it with your nonna or mom since you’re a little girl and they’re at your side saying, “More filling!” Or, “That’s too much filling!” Like my dad used to do with me when we would cook and bake his recipes together. I used my index finger to help me roll the rosette from the middle and carefully turned it around the center part. The pretty part is to have the filling sticking out, so be sure not to cover it with the dough strips. You could use apricot jam or even honey to brush on the rosettes while baking and when they are finished baking. Which makes for the ultimate Calabrian sticky bun!! I baked some in the pie plate and some free form on the baking tray. I love the loose on the baking tray. Once they cool, it’s so easy to grab one and enjoy it! Either way you bake it, you can’t go wrong. 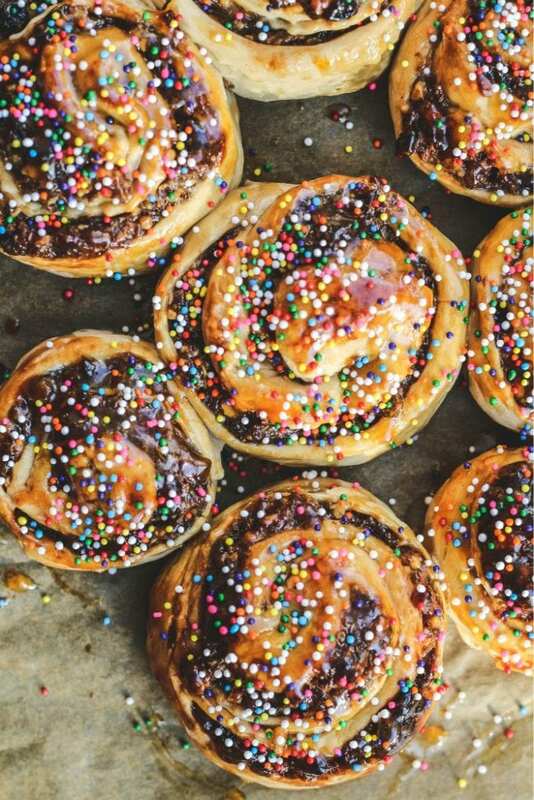 Brush it when it’s hot out of the oven with melted apricot preserves or honey and add your nonpareils for lots of color and happiness! These will be baked again next week and I think you should bake along with me! 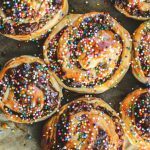 The perfect Southern Italian Christmas dessert. Pitta 'mpigliata, a traditional Christmas dessert from Calabria, mostly found in the Calabrian province of Cosenza. 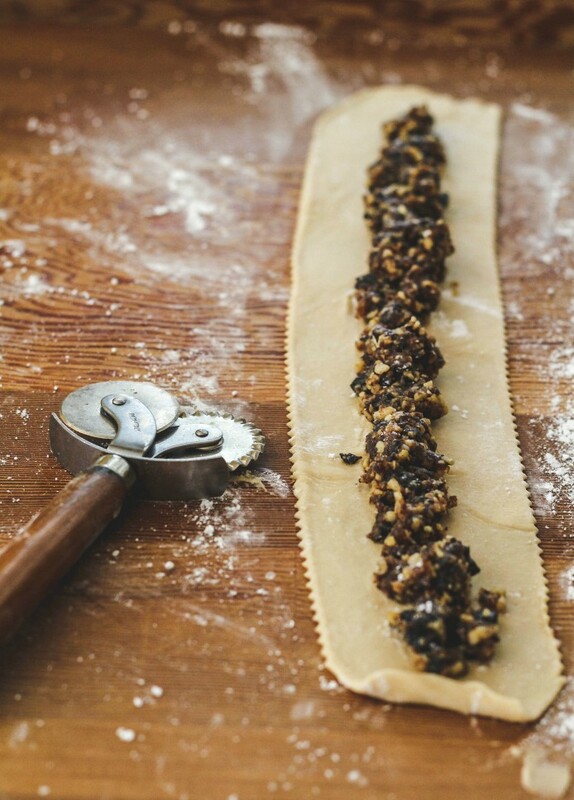 Strips of an olive oil and white wine pastry are filled with walnuts, raisins, orange zest, warm spices and doused with honey. In the bowl of a stand mixer fitted with the paddle attachment, combine the wine, olive oil, sugar, and vanilla. Mix on low speed until combined. Add 2 of the eggs. Mix on low to medium speed until combined. Change the attachment to the dough hook. Add the flour and baking powder. Mix again on medium speed until a smooth dough comes together, 3 to 5 minutes. Lightly flour a work surface and turn the dough out onto it. Knead by hand for 2 to 3 minutes. Cover the dough with a clean kitchen towel and let rest while you make the filling. In a food processor, add the walnuts, prunes, raisins, orange zest, honey, vermouth, cinnamon, and cloves. Process for 20 to 30 seconds, or until no large chunks remain. Transfer to a medium bowl. To assemble: Preheat the oven to 350F. Spray a 9-inch pie plate with baking spray. With a rolling pin, roll one-third of the dough into a 10-inch (25 cm)circle about 1/8 inch (3 mm) thick. Roll the dough onto rolling pin and transfer it to the pie plate. Trim any excess dough to the height of the pie plate. Roll the remaining dough 1/8 inch (3 mm)thick. Using a ravioli cutter, cut strips of dough about 2 inches (5 cm) wide and 10 to 12 inches (25 to 30 cm) long. Spread the filing along each strip and roll into a rosette. Place the first rosette in the middle of the crust. Repeat the process, placing each additional rosette around the first one. You should be able to make about 12-13 rosettes. 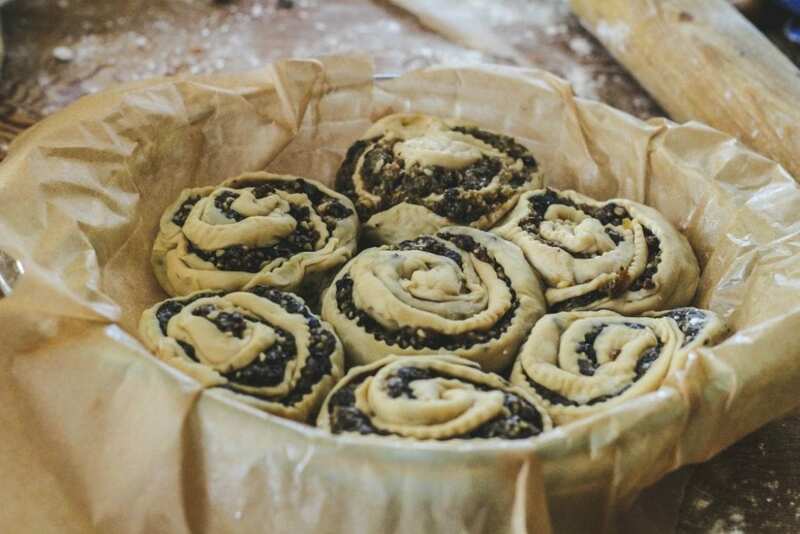 Fold in the surrounding dough. Beat the remaining egg and brush the entire pastry with it. Bake for 40-45 minutes, until golden brown. These look like such a labor of love. I'm going to surprise my family with these. This is a good idea and amazing recipe too. Something very unique and colorful. Need to try it out. So pretty! I am intrigued by the wine in the dough. I've never seen that before! These are just absolutely beautiful! 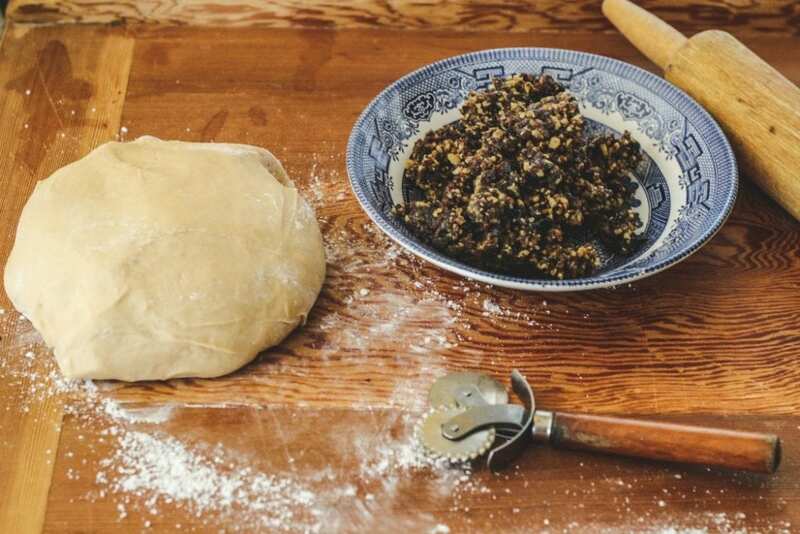 How interesting and unusual that there's wine in the dough – I don't think I've ever encountered a recipe like this before! 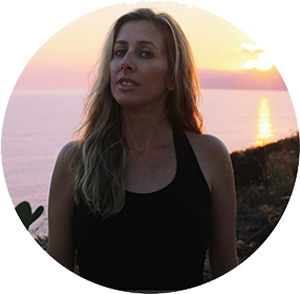 I'm so intrigued – thank you bunches for sharing this! 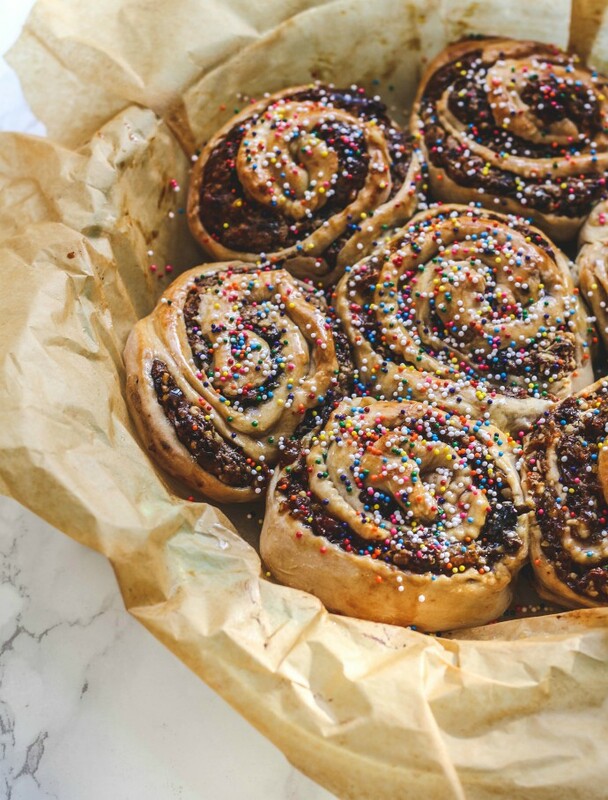 These look good and so festive! I only can immagine how good they taste! Looks like the perfect Christmas treat. My family will love these! These are SO pretty! Loving all the flavors!